The recital will feature Jessica Siena, soprano and Burr Cochran Phillips, piano. The duo will perform works by Lehar, Schubert, Puccini, Rossini, Rodgers & Hammerstein, Kander & Ebb. Siena, a national finalist in the Metropolitan National Council Auditions, was hailed as “extravagantly gifted” by the Los Angeles Times. Her portrayal of Marie in New York City Opera’s National tour of Donizetti’s La fille du régiment earned her critical acclaim throughout the country. The late jazz legend Dave Brubeck chose Ms. Siena for the role of Dora in his operatic suite, Cannery Row, at an annual Brubeck Festival. 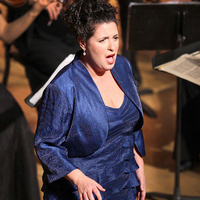 Ms. Siena was also a finalist in the Loren Zachary Vocal Competition, and the first-place winner in the Palm Springs Opera Guild Vocal Competition. Burr Phillips is Associate Professor of Voice at the Conservatory. Tickets are available in advance at go.Pacific.edu/MusicTickets or at the door.